Question: When do I need a big brake kit? - Miata Turbo Forum - Boost cars, acquire cats. Question: When do I need a big brake kit? Answer: When you can do this to Carbotech XP10s in 100 miles. Replacing the fronts with 11" Corrado rotors and M-tuned brackets, going to XP12s front and rear, and ordering a Tilton proportioning valve. My 1.8 brakes were fine for the vast majority of drivers, but with the added downforce on my car and my driving capabilities coming up to meet the car this weekend in a big way, the brakes finally waved the white flag. This isn't a critique of Carbotechs in any way - these pads worked very well both days, with a little fade in the last sessions of each day. You can't expect the pad material to make much of a difference when the heat in the brakes severely warps the backing plates. I read the title and knew the answer already. I was going to say "When you can smell Andrew's brakes as he drives by to park". What/where can I get info on this prop valve? I've got 1.8 stuff sitting on my parts car...Might have to man up and follow your lead. Last edited by miatamania; 03-24-2009 at 08:51 AM. Dude, you need to get some more airflow on the brakes. In SVRA race classes, where rules are strict for maintaining original brake sizes, I've seen huge success with good brake cooling schemes on some tiny-*** rotors. Pad wear like that is atypical. That's caused by a variety of issues, but there is definitely a problem when you get uneven wear top to bottom. 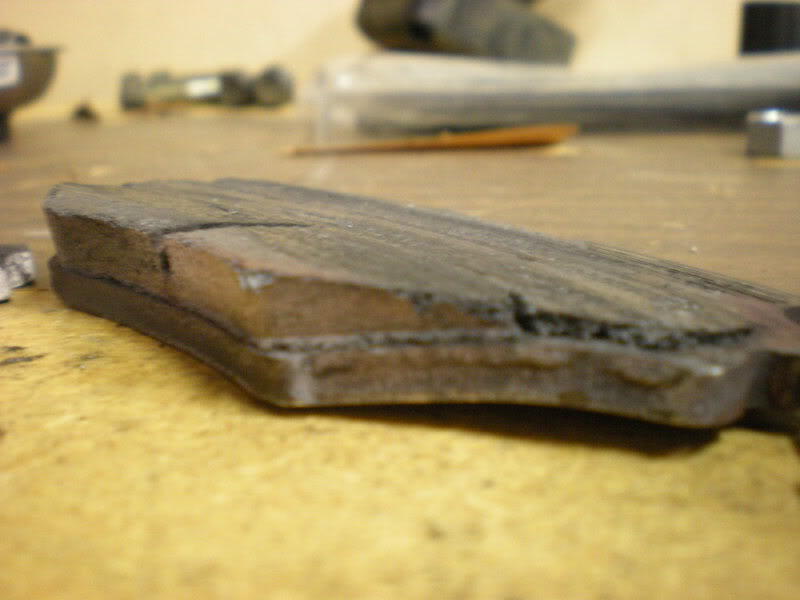 The only uneven wear that's normal is on the leading edge of the pad. And we usually tapered the pad to minimize that. Think about tire wear, then look at your pad. You're not using but maybe half of the pad and inefficiently at that. 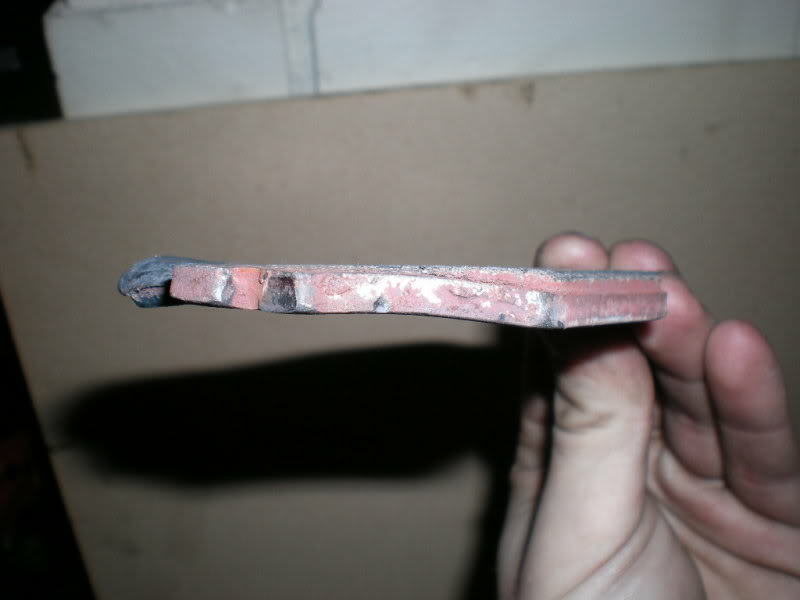 Uneven wear like that brings a quick end to a brake pad due to overloading in one area creating excessive heat and wear. The Miata brakes are lot better than they get credit for. Cooling and proper pad material ftw. I've cited this example numerous times, but it's a good example. We ran a four hour enduro at Daytona in a 99 that weighed in at 2350# w/o driver. We were on the massive spec hoosier tire (225-45-15), with hawk blues, stock calipers, brembo rotors and two brake vents/hoses running from the mouth to the calipers. Running a 4.10 rear the car was just over 7k into the bustop chicane brake zone and a bit higher into the T1 brake zone. So not a turbo car, but certainly turbo speed. Car had 1/3 pad material left at the end of the race and I can say that for at least the first two hours of the race (my stint) the brakes were used to their max. Brakes are no different than anything else on the car- they require tuning, adequate material/parts, and proper (driver) application. I'm not saying bigger brakes won't fix your problem, I'm saying that your current brakes are probably operating at about half their potential. M2, I'm fully aware it's atypical wear. I did this at Laguna Seca which is notorious for being very hard on brakes. My aero setup doesn't help at all. 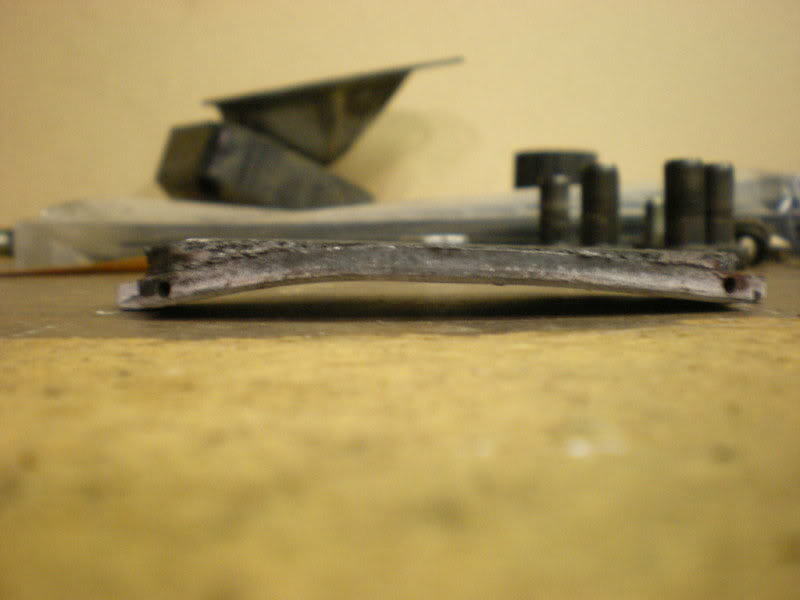 The inside-outside uneven wear came from the outer pads, which had the claws of the caliper dig into the backing plates and twist them out of proportion. The inner pads were better, but the piston itself actually pressed into the pad so hard that it slightly warped that one too. I used most of the inner pads and maybe 70% of the outer pads. Ducting is on my list of things to-do. The prop valve will make a big difference as well; the rear XP10s look nearly brand new still, an indication of how poor the stock bias really is. Sav, I've found that when you don't use the brake pedal you don't wear down brake pads. You should slow down and coast more like wine and cheesers. Ducting and XP12's should work out very well. Good job on that Andrew! My answer to the same problem was to get bigger brakes and a MSM front bumper. I'm going to run brake ducts from where the fog lamps are supposed to go. This Natty Light has a nice bouquet. Speaking of wine, I got 2 free bottles from one of the organizers on Sunday. Last edited by kotomile; 03-24-2009 at 11:11 PM. I took a drive to a local winery this weekend with the girlfriend to drink some free wine and so she could buy some bottles to replenish her supply. As we were getting ready to leave, an older guy and his wife approached and asked about the car. He said he had one as well, blah blah. I told him I wish I would have got over the "*** car" stigma sooner and actually driven one a few years ago, because I love the way the car drives (other than a lack of power which is currently being addressed). He and his wife were like "Oh really? We've never heard of thm being called that." After they left, my GF asked "What rock have they been hiding under to not know that?" i've seen backing plates on stock miata brakes melt before at thunderhill--not my car. the solution was an F430. That much heat can't be good for the front hubs. My answer was going to be "when you realize sliding calipers are ***." That last picture is what my brand new EBC Redstuff pads looked like after a weekend at the track. worst pads ever. Why don't you guys run hawk blues at the track events? You're not doing anything less than racing IMO. Cause I was cheap, got a huge discount since I sold the pads and was told they'd be fine for a 2000 lbs car at 170rwhp. Even the rears were at the backing plates. I now have a set of xp10/xp8s, the Corrado rotors and a Wilwood proportioning valve for this season. i know they expensive but get the front big brake kit from willwood. ask sleeper mx5 he has been in my ride he loves them. he thinks i am going to kill him but then my car stops. i have had them for 5 years and they are the best..
brakes (like clutches) are energy conversion devices. brakes convert kinetic energy into heat. in order to work, you have to be able to transfer heat effectively from the brake pad interface to the atmosphere. if you can't get the heat OUT of the brakes, they are not effective. so while you might think bigger brakes = bigger heat sinks, you'd be right but you'd also be missing the point that you still need to transfer heat from the disc to the atmosphere. GET SOME DUCTS ON THAT THANG. because I want to keep my 6ULs pretty. HP+ screwed up my 99-wheels pretty bad. You need brake ducts. The new metal **** can't help brake temps. Also, I wonder what the big splitters do to trans and rear end temps? Quick Reply: Question: When do I need a big brake kit?